Types of wines: Light-bodied, very aromatic and fruity white wines, sometimes slightly effervescent or fully sparkling. 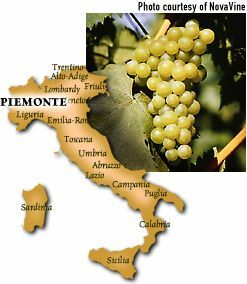 Origin: Widely known in Italy as MOSCATO di CANELLI because of the success of the Piemontesi wineries which have made it famous as ASTI SPUMANTE, Moscato Bianco is the fourth most widely planted grape in Italy. No matter where it's produced, the wine is almost always sweet, low in alcohol and frizzante (frothy) or spumante (sparkling). There are some versions made without bubbles, called naturale, but the grape's inclination to ferment rapidly makes this style difficult to produce. The best examples of these sparkling Muscat wines are MOSCATO D' ASTI and ASTI SPUMANTE. Description: Amazingly fragrant (rose petals and lichee fruit come to mind), Moscato Bianco's fresh grapey character is easy to recognize, even when distilled as grappa. The best examples combine creaminess, a bright, refreshing fruitiness and a crisp, lingering finish. Aging: No need. Except for very rich, dessert styles, the wines are most charming young. Best location: Wherever it is planted. FastFoodFacts: Enjoy Spumante wines alone or with a slice of pannetone. Serve other styles of Moscato Bianco with fresh fruit, pistachios or light pastries that are not too sweet.